A long-standing ambition to refurbish Pages Park Pavilion in Leighton Buzzard looks to be moving forward as the town council now has the funds. 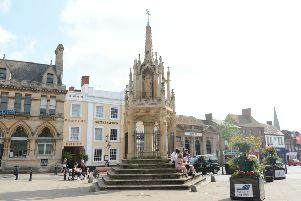 Leighton-Linslade Town Council’s policy and finance committee has approved plans for the upgrade which was first put forward in the council’s ‘five year plan’ in 2015. It says after several years of prudent financial management, it is now in a position to take the project forward. Pictured at Pages Park Pavilion from left to right are Cllr Ray Berry, Cllr Amanda Dodwell, Cllr Carol Chambers, Cllr David Bowater and Cllr Steve Cotter. The committee heard that the options were to either refurbish the pavilion, or to demolish it – with the cost of the refurbishment (£330,680) not being significantly different to the cost of demolition. The majority of councillors agreed that the pavilion is a valuable community asset that should be preserved, and resolved to recommend to full council that the refurbishment should go ahead. Cllr Ray Berry added: “Some of our colleagues did raise concerns about the cost of the project, but when it was pointed out that it would cost almost as much to demolish the building they accepted that the town would never forgive them if they did not back this plan. The pavilion is also a sports hub for the town. Cllr David Bowater said: “The local Croquet club uses the pavilion as their base - it is good to see this facility being used by a group that otherwise would have nowhere to meet. The proposal goes to full council this evening (January 28).